This thesis reconstructs Reformed—and later, Presbyterian—thought by analysing the influences on the formation, changes in conception, and purposes of Scotland’s covenants from the emergence of covenantalism at the initial Reformation in 1557 to the Glorious Revolution of 1689—90. To achieve this, it has relied primarily on covenant documents and sermons. It has challenged the idea that Presbyterians comprised a homogeneous and fixed group in opposition to the crown’s ostensibly Episcopalian policies. Rather, this thesis argues that Presbyterian thought was transitory and was influenced by particular historical contexts, biblical exemplars, and to a lesser extent cultural norms such as the promissory nature of Scots contract law. It is not possible to investigate Presbyterians in isolation, so this thesis has also considered the relationship between different societal actors such as the national claimant, local elites, and ordinary people. 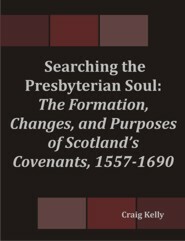 This analysis has brought into question many of the historiographical constructs that have been imposed on Scotland’s Presbyterian and covenantal history. The idea that it is possible to solely focus on one key event such as the signing of the National Covenant and conclude that this was a Second Reformation has obscured the broader narrative. Historians have approached the sources with preconceptions such as the idea that there was such a thing as separate religious and political spheres which has led them to disregard religious sentiment as mere political posturing. Covenantal ideas had both political and religious significance: often starting as religious expressions and developing political implications such as the democratic imagining of the City of God that went on to influence the desire for ordinary people’s participation in political and ecclesiastical governance. To compare Scotland’s covenants, this thesis has used the Cambridge School methodology and Mendenhall’s covenant formulation. This has been particularly helpful in demonstrating that changes in ideas were not progressive or linear. Instead, covenantal ideas often oscillated between different conceptions: the desire for limited monarchy was articulated in early covenants, later there was a recognition of the divine right of kings, and later still a return to the aspiration of limited monarchy. Whilst the covenants were effective vehicles for forwarding Presbyterian ideology, they were limited as a result of the fact they were Presbyterian documents. As such, the best they could hope to achieve was to unite the Presbyterian community around a common goal. Once Scotland had a Calvinist king on the throne, however, Presbyterians were able to pursue their desires through parliamentary legislation in the form of the Claim of Right. It was able to turn Presbyterian thought into national orthodoxy: which is exactly what it did by securing limited monarchy, nascent democracy, and Presbyterianism as the creed of the Kirk. Therefore, contrary to the views of many historians, the Glorious Revolution—as embodied by the Claim of Right—was not a watershed for secularism and was instead part of Scotland’s Presbyterian history. It is, therefore, suggested that the events between 1557 and 1690—from the beginning to the end of covenantalism within mainstream Reformed and Presbyterian ideology—are reimagined as a Long Reformation process. After graduating with first class honours from the University of Dundee in Scotland, Craig swapped university and country as he completed a two year master's degree at Uppsala Universitet, Sweden. He is currently working in Scottish politics but is looking to return to academia and pursue a PhD in the future. Craig has particular interests in the intellectual, religious and political history of early modern Europe, in environmental history and in historical ecology.